A MASTERPIECE FROM THE BEST-SELLING AUTHOR OF THE DARK SIDE OF LOVE -- A murder in Damascus, a love with the power to save a young man’s life… In his latest novel, Rafik Schami ventures to the land of his childhood, where he is now unable to safely return: Syria. As a young girl, Sophia falls deeply in love with Karim, but weds a rich goldsmith instead. A few years later, Karim is accused of an assassination he did not commit and Sophia saves his life. He promises that she will forever have his loyalty, no matter the risk to himself. Long after the incident is buried in memory, Sophia's only son, Salman, returns to Damascus after forty years of exile in Italy; when his photo appears in the newspaper, he is forced into hiding and fears for his life. Remembering Karim’s promise, Sophia decides to call on him for help in spite of the many years that have passed, and the lost opportunity of their once-consuming passion. 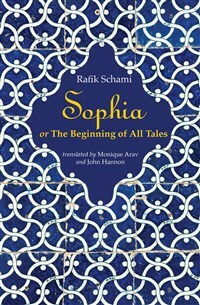 Set during the tumultuous years leading up to the Arab Spring, Sophia delivers the intricate plotting and lyrical prose that Schami’s readers expect, and reveals the power of love to overcome all barriers of time and circumstance. Rafik Schami was born in Damascus in 1946, went to Germany in 1971 to study, and stayed on to become a leading German novelist and a pivotal figure in the European migrant literature movement. His novels have been translated into 22 languages and have received numerous international literary awards including the Hermann Hesse Prize. His translated works published by Interlink include Damascus Nights, The Calligrapher’s Secret, A Hand Full of Stars, Sophia, and The Dark Side of Love, which received a starred review in Publishers Weekly and was a 2010 Winner of the Independent Publisher Book Award Gold Medal. Peter Knorr is a freelance illustrator and graphic designer living in Nierstein am Rhein, Germany. He illustrated numerous award-winning children's books for various German publishers, including works by authors such as Erich Kästner, Kirsten Boie and Paul Maar. He is also an illustrator for the ZDF children's series “Siebenstein.” His work has been honored by the German Book Art Foundation.